A must for any young sports fan, this lamp will brighten up any room and light the imagination with its colorfully-shaped balls on its base. 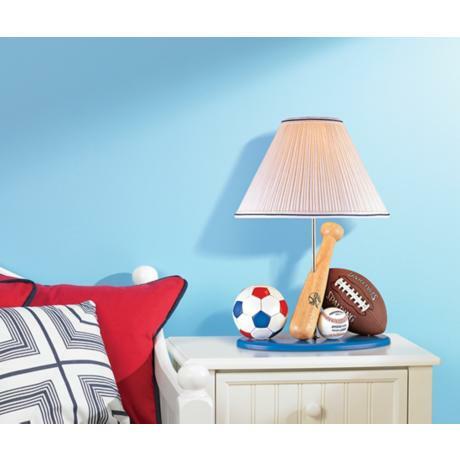 This charming, 21 1/2" high table lamp celebrates good sportsmanship of all kinds. Made of sculpted resin, the lamp is both sturdy and functional. with a pleated white shade with a 14" diameterand a bold blue line. Blue oval base. Uses one 100 watt bulb (not included). - Pleated white shade with blue trim. - Lite Source table lamp design. - Takes one 100 watt bulb (not included). - Shade with 14" diameter.